Announcement Unique, unusual and utterly glamorous creations for brides, maids and special occasions. Vintage brooches, elegant rhinestone embellishments and luxurious beaded laces are all used to create custom hand crafted creations. 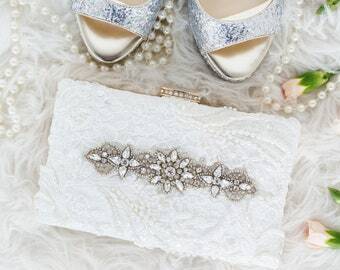 Couture clutches, beaded bridal headpieces, dreamy designs and outstanding customer service combine to create wonderful and one-of-a-kind accessories to accentuate your big day. Elegance meets excellence in every way. 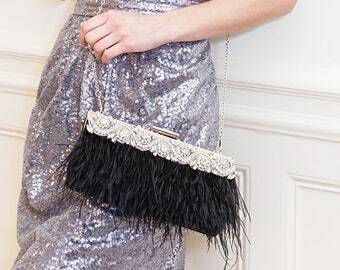 Design your accessory story with Cloe Noel Creations. Cloe Noel also offers FREE shipping within the United States. 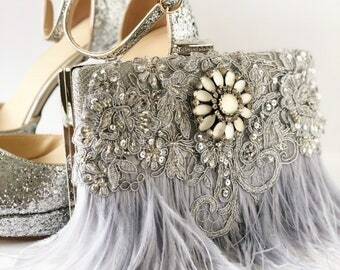 Unique, unusual and utterly glamorous creations for brides, maids and special occasions. Vintage brooches, elegant rhinestone embellishments and luxurious beaded laces are all used to create custom hand crafted creations. Couture clutches, beaded bridal headpieces, dreamy designs and outstanding customer service combine to create wonderful and one-of-a-kind accessories to accentuate your big day. Elegance meets excellence in every way. I ordered this for my daughter's wedding. 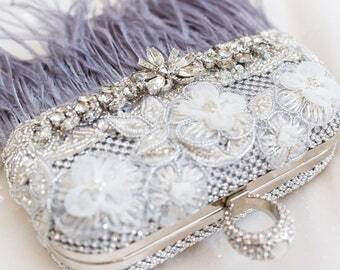 Not only is it exquisite and the perfect accessory for her stunning wedding dress, but the product came boxed in a way that it was surely a gift. The box was wrapped in a lavender and crystal bow (purple is her favorite color) which was very unexpected and quite pretty. This is a quality product which arrived in a timely fashion and will be a piece my daughter can save and hand down to her daughter for a special occasion someday. LOVE IT! 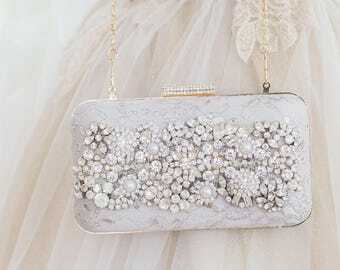 Make a statement with a gorgeous rhinestone jeweled clutch. Perfect for your rehearsal dinner or wedding day. 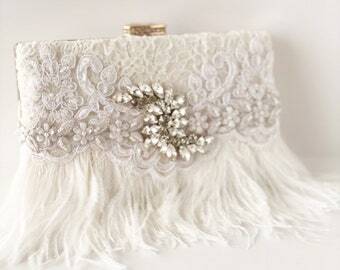 Brand new Couture bridal clutches all designed with gorgeous embellishments and vintage jewels. Gorgeous rhinestone and trims are designed on all collections. Four years ago, I fell in love with some vintage brooches in an antique market. I took them home with me and created the most glamorous bridal cuff bracelet, using one of the brooches and some beaded lace. This was the beginning of the Cloe Noel brand. I’m Kim by the way, professional Treasure Hunter and Beauty Seeker. 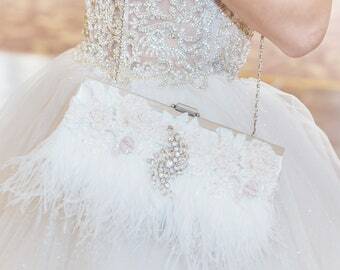 I have always loved sparkle and beautiful bridal accessories, but even more so when teamed with vintage and unique brooches and jewels. It is these that give an accessory a sense of story and there is nothing I love more than hunting high and low for that perfect piece to complete my couture creations, making every single accessory truly special for each bride. I’m a hopeless romantic, a fashion-focused creative, a cat lover (my brand is named after my favourite feline friend) and a bit of a perfectionist, working tirelessly to achieve the perfect creation for my customer. 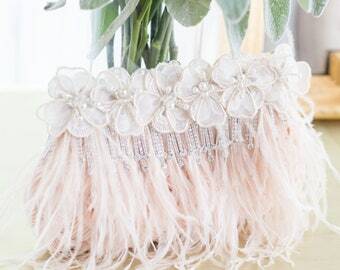 I love to find out about my bride and craft something that sums up her individual style, whether it be a headpiece, a beautiful bridal cuff or a couture clutch, it’s all about reflecting you, building a relationship together and delivering a memorable experience and something that you will treasure forever. Because when it comes to treasure, I’m definitely your girl. Cloe Noel has been so lucky to be published in some amazing Bridal magazines and Wedding Blogs. I live in sunny South Florida and love anything that sparkles! I am always inspired by the gorgeous vintage brooches and rhinestone trims that I collect. 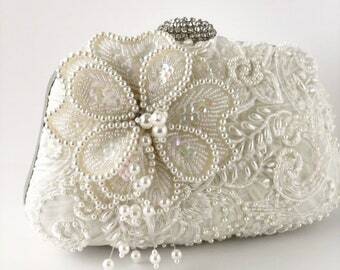 I love working in my studio to create glamorous bridal accessory collections for brides.